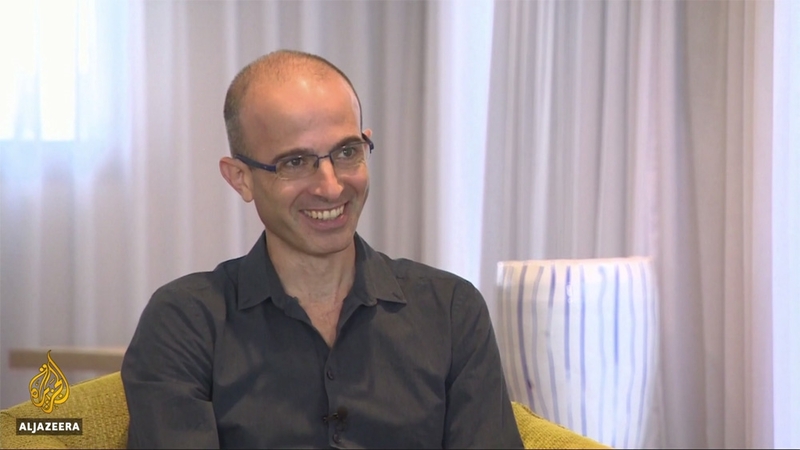 In an interview with the Talk to Al Jazeera programme, Harari discussed technology, immigration and politics with Al Jazeera’s Harry Fawcett in Tel Aviv. Similarly, the combination of AI and bio-technology means that we are very close to the point when you can hack human beings. There’s a lot of talk about hacking computers, emails and bank accounts. But we are entering an era of hacking humans. And I’d say the most important fact anybody who is alive today needs to know about the 21 century is that we are becoming hackable animals. Harari: It starts by having corporations and governments amass enormous amounts of data about where we go, what we search online and what we buy. But this is all surface information about our behaviour in the world. The big watershed will come once you can start monitoring and surveying what is happening inside your body and inside your brain. Then you can really hack human beings and we’re very close to this. Already, a lot of people go about with Fitbit fitness trackers that constantly measure their heart rate and blood pressure. You cross that with what you buy and what you search online, or what you read or what you watch on television. You watch a movie and at the same time Netflix knows what is happening with your heart rate or your brain. Al Jazeera: There are a lot of concerns around AI taking a bigger role in the future. You don’t seem as worried about that. Why? I think it’s highly unlikely that in the near, or even medium, future AI will gain consciousness and start having feelings and desires of its own and start killing people. That is science fiction. I really like science fiction but I think the worst service that it has done over the last few years is to distract people from the real dangers of AI, and focus them on unrealistic scenarios. I’m not against giving more authority to AI, but the question is, who is the master of AI? Does it serve a small elite or big corporations? Does it serve dictatorial governments? Or does it serve me? You can use AI to create a total surveillance regime of the government, controlling the population. And you can use AI for the citizens to survey the government and make sure there’s no corruption. The same technology can go both ways. Al Jazeera: You said that your latest book is one for “right now”. Politics right now are more roiled than they’ve been for a while and you’ve suggested that Brexit may unravel both the United Kingdom and the European Union. How do they unravel from this point? I don’t think there’s anything inherently wrong with Brexit. We saw the UK wanting to be independent from the EU, the problem is really one of timing. All of the global problems – AI, climate change, nuclear war – have no national solutions. You cannot prevent climate change on a national basis. You can reduce your own greenhouse gas emissions to zero, but if the other countries are not doing the same, it won’t help. Similarly, you cannot regulate AI on a national basis. Al Jazeera: Brexit was inspired, to a large extent, by fears of greater immigration. Do ideas you’ve talked about like culturism not give license to people who are racist and who fear people unlike them coming into their zone as we see happening in the EU at the moment? The thing about arguments regarding culture is that sometimes, not always, they are correct. Whereas, there is no scientific basis for thinking that there are significant biological differences between people. What we need to remember is that cultures change and people change. Even if you are born into a particular culture, it doesn’t mean that for the rest of your life you can’t change your world view, your morality, or your behaviour. Within the lifetime of a person, an entire culture can change in a tremendous way. If you think about Germany over the last 100 years, it has undergone so many cultural changes. Germany’s culture in Hitler’s time and in Merkel’s time is completely different and at least some of the people are the same. Al Jazeera: Some of your harsher reviewers have said you are good at diagnosing the trends and problems but you’re less forthcoming when it comes to proposing solutions and answers. Harari: It’s true, it’s much harder to find solutions but it is also very hard to pinpoint the problems and the questions. I see my main job at present in just bringing clarity by making people focus on the most important problems. Then comes the issue. So what are the solutions? In many cases, we do know what the solutions are. It’s just difficult to implement them, especially without global cooperation. With climate change, we know what the solutions are. It’s no longer a big mystery. We know what kind of technologies we need to develop and we can do it. We know what kind of environmental regulations we need to enforce and we can do it. But the problem is there is no political will. With AI and bio-engineering, it’s far more complicated because nobody knows where it’s going and nobody knows what kind of possibilities are opening before us. Even here, there are many things we can do. The problem is the lack of political will and, even more, the lack of attention. If people focus on these issues, I don’t think the solutions are so difficult.